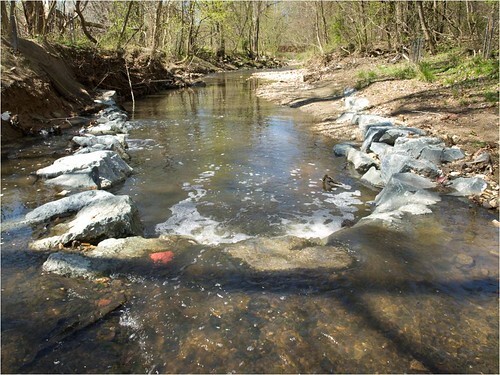 Stream restoration is a set of techniques or methods the County uses to protect adjacent properties and public infrastructure by reducing stream bank erosion, minimizing the down-cutting of stream bed, and restoring aquatic ecosystems (natural stream system). 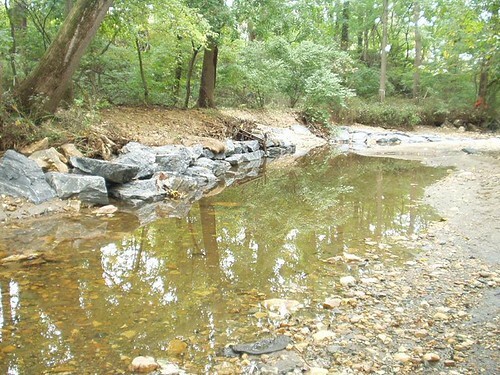 Restoration techniques typically use natural materials such as rock, logs, and native plants to help slow down stormwater flow and restore the natural meander of curve pattern found in stable streams. They are usually done in larger scale projects utilizing large equipment to mobilize plants and rocks. Layers of live branch cuttings are placed horizontally along the stream. New plants will sprout from the live branches and the roots will hold the soil down and prevent erosion. Heavy mesh netting made from coconut fibers, used to hold soil in place and help plants grow, reduce weeds, and retain water. They naturally breakdown over time and become part of the soil. 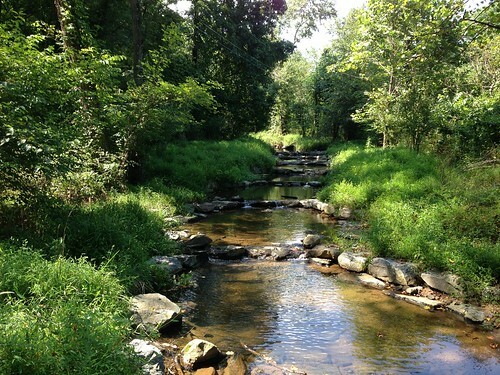 Stones are placed in streams in the shape of a “C” or a “V” to direct water towards the center of the stream away from the stream bank and reduce erosion. Steep stream banks are graded into a series of gently sloping steps. 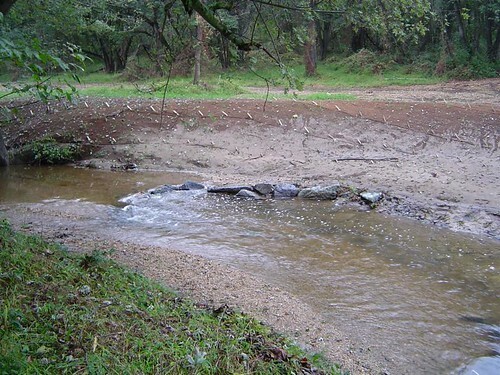 During large rain storms, the stream has more room for water to flow and decrease the speed of the flow. 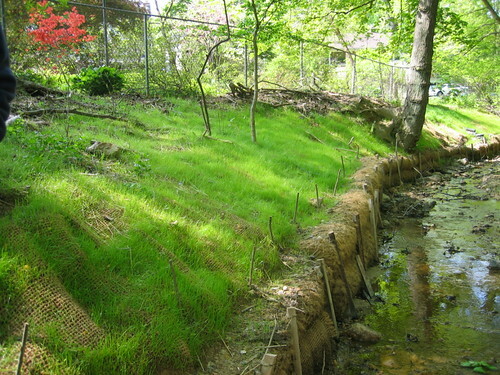 In addition, the plants and vegetation roots help stabilize the banks and hold them in place. Rocks are placed in streams in the shape of a “J” to channel the flow of water away from eroding stream banks. The “hook” or curved tip of the “J” has slots for fast-flowing water to pass through and creates small pools (scour pools) where aquatic creatures can live. 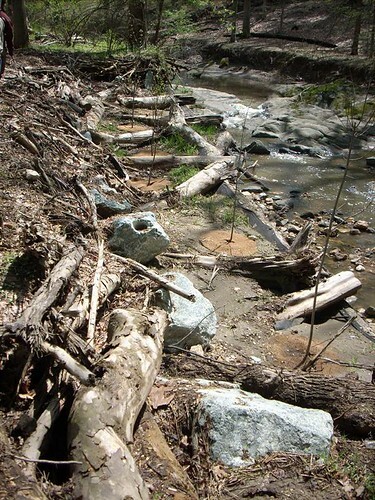 Logs are placed and anchored to direct stream flow away from eroding stream banks towards the center of the stream. The concentrated stream current forms small pools (scour pools) below the vane where aquatic creatures can live. 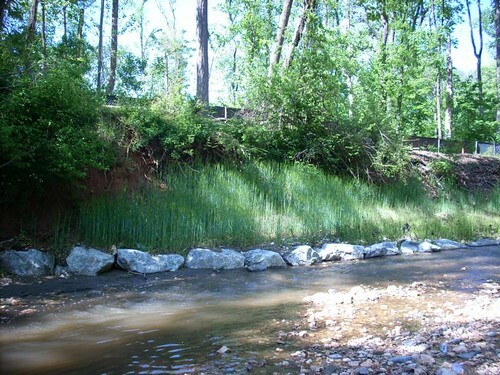 Lengths of stream bank are planted with plants to stabilize the banks and hold soil in place through the roots of the plant. Tree stumps with attached roots are anchored in stream banks with roots facing the streams to slow down flow and provide habitat for fish, amphibians, and aquatic insects. 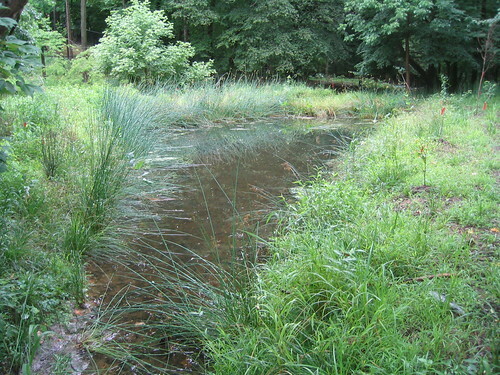 A marshland-like environment is created below a storm drain outfall to allow treatment for the stormwater before it reaches the stream. It also provides for aquatic plant and animals. A series of pools built with rocks that mimic staircase steps to slow down stream flow. This is often used to protect utilities such as sewer crossings, etc. 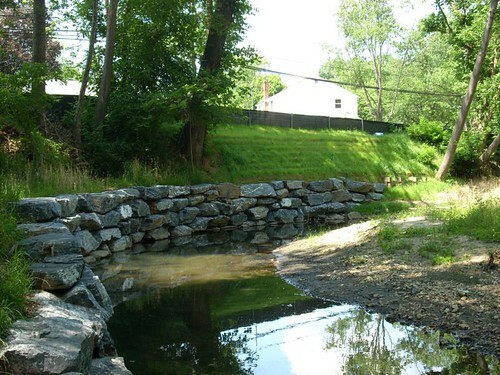 Large stones are placed at the base of the stream bank to prevent fast moving stormwater runoff from wearing away and destroying the stream bank. 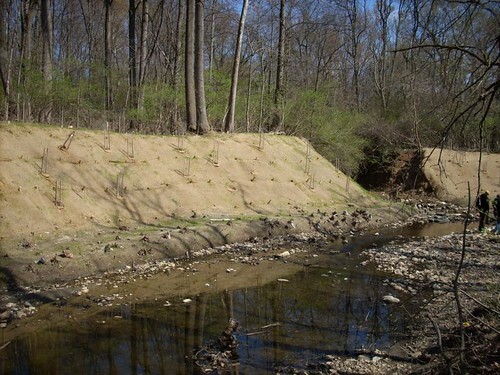 The stream banks can also be carved back to a gentler slope where native plants are planted to hold the soil in place. 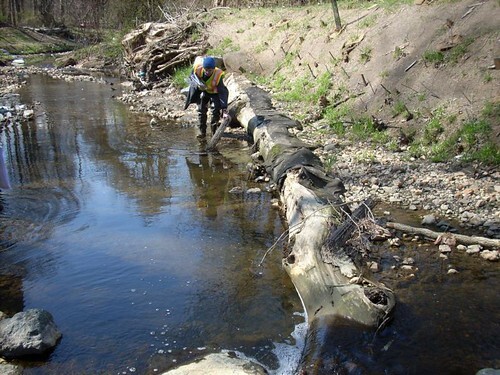 Woody debris includes logs and woody material, which can be used to provide spaces where fish can live and reproduce. 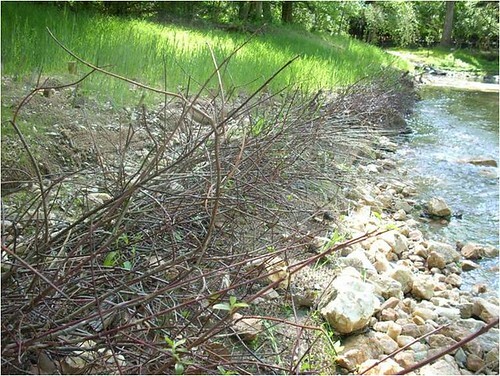 Large tree limbs and woody materials are anchored along stream banks to reduce erosion and to buttress terraces and pools.